As I'm sure many of you have noticed, I haven't been posting as much in the past few weeks, this is due to many personal factors that need to take priority in my life, including de-cluttering (no seriously, it's awful I can't even concentrate on reading at times!) 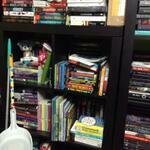 However, I do have a fun new series of posts set up to chronicle my Spring Cleaning of bookshelves (i.e. purging of many, many books). My name is Hayley G, and I'm a Book Hoarder. My family has been teasing me about this for a while now, well to be honest the teasing has turned into more of a concern for my well being (I'm practically buried alive with the amount of books taking up residence in my home). My response to this would always be "you just don't get it, I'm building a library" or "I like to re-read my books!" which is true for many of the titles I own, but the fact is I have let this "passion" get so out of hand that I'm buying doubles (sometimes triples) of the same book! All because I can't keep up with the books bought vs. books read ratio I seem to have developed over the past couple years. I'm buying way more titles than I can ever find the time to read. So I tell myself, "well, I'll just go through my books and sell or donate the ones I won't read ," which seems simple enough right? Wrong, this is where the real problem lyes- once I find titles that I haven't read (and to be honest probably won't ever read since it's been YEARS since I bought them) I can't seem to actually let them go. I try to rationalize that I "could" read them once I get myself more organized, or I just LOVE how they LOOK on my shelf, so I end up donating or selling like five books out the hundreds that I may never read, and the books (and mess) continue to pile up. It's gotten a lot worse since I started receiving ARCs from publishers through work and my blog. Don't get me wrong I LOVE ARCs, but I think I may have attachment issues with these as well. So to help me deal with my hoarding and-by-extension, clutter, I will be posting quite a few ARC giveaways in the coming weeks, as I continue with my Spring Cleaning and de-cluttering. These "Book Hoarder Confessions" posts are going to help me chronicle my progress, and I think it will also be very therapeutic to put my thoughts to words. As of right now, I have 10 crates of books (the contents of which I'm not even sure) stashed throughout my basement and crawl space, I have 3 full crates stationed and stacked right outside my bedroom, 30 shelves stuffed and overflowing with books, and a closest stacked with books. My hope is to come out of this process knowing ALL the titles I possess and be able to breathe a sigh of relief that I will FINALLY have control over the amount of books in my possession. Because, let's face it, both my books and I deserve better than this current system. To be completely honest, these pictures don't due justice to the TRUE clutter, but as I'm sure you can tell there's absolutely NO organization and it's driving me nuts! Are you a book hoarder, or have book hoarder tendencies? (I seriously hope I'm not alone haha). But seriously: I get it. I can always justify why I need this book, or why I can't let go of that book ... It's a never-ending cycle. And then I get blogger envy when I see these massive IMM/StS posts on the weekends and say, "But *I* want those, too!" I've gotten better. Especially about the ARCs. I used to hoard them because they were super-special. When I first started blogging they were like a sign that I had made it as a blogger. That I was being taken seriously. I kept them all and bought finished copies of the books I loved. But I rapidly ran out of room. I have 6 under the bed boxes (King size bed), 2 massive bookshelves with a piece of ply-wood bridging those shelves to act as another shelf, a dresser that has shelves I use as book shelves, and I STILL have stacks of books in a corner nearly 5 ft high. And don't get me started on my closet. Most girls have purses on the top shelf and I have more books. I was drowning, so I made the decision to inventory the books and get rid of 2 boxes. I gave them to friends and family and even coworkers. It got worse when I came back from BEA with over 100 books and nowhere to put them. Again, I inventoried and got rid of another couple of boxes. I force myself to do that frequently now when it's getting to be too much. I know I'll be at BEA in a couple months (!!!!!) and will get a lot more so I've decided I can't request or buy any books from now until then. There's a million ARCs I want, but I have over 100 unread books in my room now. I have so many review copies to read I can't get to the books I bought myself for Christmas or my birthday. Jesus, I didn't mean to post that much. All I'm saying is I get it: But you have to force yourself to stop somehow. Thanks for stopping by and leaving such a thoughtful response, Hannah! I'm glad I'm not the only book hoarder I know, haha! I used to buy bags of books at yard sales and library book sales but since my life took a financial turn for the worse, I haven't been buying them. It wasn't until I started blogging again, did I really want to OWN books again. I am not a big re-reader so I'm not sure why I need to have them on my selves at all. Good luck with decluttering your shelves. 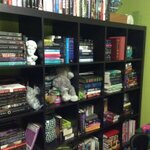 I am looking forward to reading more of your Book Hoarder Confessions!